Dunst stars as Theresa who works at a legal cannabis store and enjoys her job. Her mother dies suddenly though after Theresa gives her a poisoned joint in assisting her suicide. Theresa knows it was the best thing, but is still distraught about it. Soon after this, an elderly man asks Theresa for the same joint so he can go peacefully on his own terms. She obliges him, but turns out she gave a dear friend the poisoned joint instead, causing his death. From here, Theresa has a very difficult time talking with her friends and even her husband Nick as she tries to make sense of everything, which culminates in her to smoke five poisoned joints, all of which have different effects, but don’t kill her. This sounds good on paper, but the execution wasn’t all there. Characters aren’t given full story arcs and some of the dialogue is rather lazy. You can tell the film ‘Requiem For A Dream‘ was an influence here with some of the same camera shots and story telling, as well as the Simpsons‘ episode where Homer eats the hot pepper and meets Johnny Cash. That sounds awesome, I know, but with ‘Woodshock‘, it’s not as cohesive, nor is it as fun. Still, this is a worth a watch. 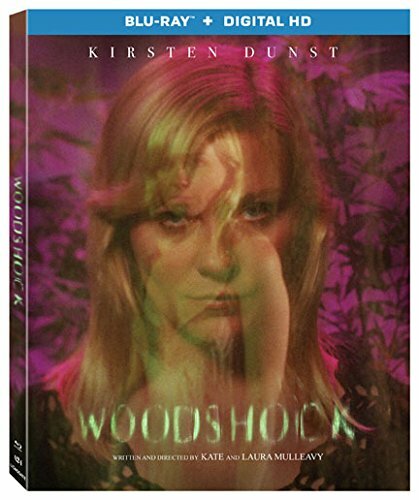 The Video: ‘Woodshock‘ comes with a 1080p HD transfer and is presented in 2.40:1 aspect ratio. This is a rather dark look film without a ton of primary colors to boast about on screen. Instead, colors are relegated to the darker tones of blue, silver with some faint moments of decaying oranges and browns. There are some filters applied too, which might hinder the detail a little bit here and there, but is mostly a sharp looking presentation. Black levels are mostly deep too as skin tones are on the cool side of things. Detail showcases some makeup blemishes, wrinkles, and facial pores nicely as in some better lit scenes, individual hairs. The lace and stitched curtains can be seen easily with great textures too. There were some minor moments of video noise, but it’s not a complete and consistent issue. Still, this video presentation has good marks. The Audio: This release comes with a lossless DTS-HD MA 5.1 mix and does a great job of certain surround sounds. Most sound effects are robust and lively with a rather immersive audio mix. Ambient noises from the exterior scenes do bring life to the rear speakers with nature sounds and other wooded audio moments. Bass comes into play with a good low end, but is never rocky. The score is great and always adds to the tone of the film, but comes through softly. Dialogue is clear and easy to follow when it happens, and is free of pops, hiss, and cracks. Making Woodshock: A Mental Landscape (HD, 14 Mins.) – Interviews with the Mulleavy sisters, who discuss making the film. This is standard EPK fluff. ‘Woodshock‘ isn’t the best film, but has some original plot-lines to it, even if it’s not executed cohesively. Kirsten Dunst is always good, and she shines here, but there is something lacking from her character. The video and audio presentations are both good, but the one extra is EPK fluff. It’s worth a watch though. This entry was posted on Monday, November 27th, 2017 at 11:04 am	and is filed under Film, News. You can follow any responses to this entry through the RSS 2.0 feed. You can skip to the end and leave a response. Pinging is currently not allowed. Francis, you really should see somebody.